Note: The salary is in 1996 dollars. Which still isn’t a lot. She may not be worth more than rubies, but if Mr. _______ can find a Psalm 31:10 wife, she’ll at least be worth a salary increase and the blue house! It’s actually Proverbs 31, but you’re right. George is trying to ruin my reputation. Of course I know that’s Proverbs. If I wasn’t already out I’d probably be excommunicated for making this mistake with the most important chapter in the Bible for women. But I am sure they follow I Timothy 5:19: Don’t accept an accusation made against an elder unless it is confirmed by two or three witnesses. And you would be correct…on both counts. Ahhh, the church believes in slave wages for anyone but *the Pastor*, the high and exalted MoG. Somewhat before that time (1987) I was at a Christian School Fair at BJU. I was looking at employment as a Social Studies Teacher, and was appalled at the salary “offerings” and the extracurricular demands made on the teachers. I found out that many of the salaries were based on Dr. Dewink’s book on Christian schools. The salary of a teacher was pegged at 50% of the salary of a pastor — and mind you, the “salary” of a pastor usually did not include the “housing allowance,” cell phone and a host of other expense accounts and amenities. A wonder I didn’t get kicked out of BJU right then! So I signed up for grad school, teaching mathematics, with a view to getting into public education. I taught college mathematics for 25 years before my present job. Our church school paid so little that female teachers had to live with families in the church. When one of them became engaged to a man who had been previously divorced, she immediately lost her job. I had to go back and read it again! You’d think that with all that money saved in not purchasing spell check they be able to pay the poor Bro. a sustainable wage, or at least minimum wage. I thought Christian ministries were run by biblical principals. He “coordinates” an awful lot. But hey–salary and bennies makes it worth it. Two weeks vacation but only one Sunday. What part of the South is this church in? I don’t know, BJg, I know of a church in the West that operates exactly the same way, except for the wage part. Only the CEO get’s a wage, everyone else is an unpaid hireling. Wow control issues – how does the blue house suddenly become available when he gets married – and where does he live now? how many houses do they have that they identify the house by color? Wouldn’t they usually just use the address? Or do they have multiple houses on that street and the color is the easy way to identify it? They only have one house, but referring to it as blue gets around the issue of illiteracy amongst the church leadership. It reads as if he lives there now – but can get bumped out for other events – until he gets married – then it’s his all together. A: You know that other house the church owns? The little one out behind the blue house? 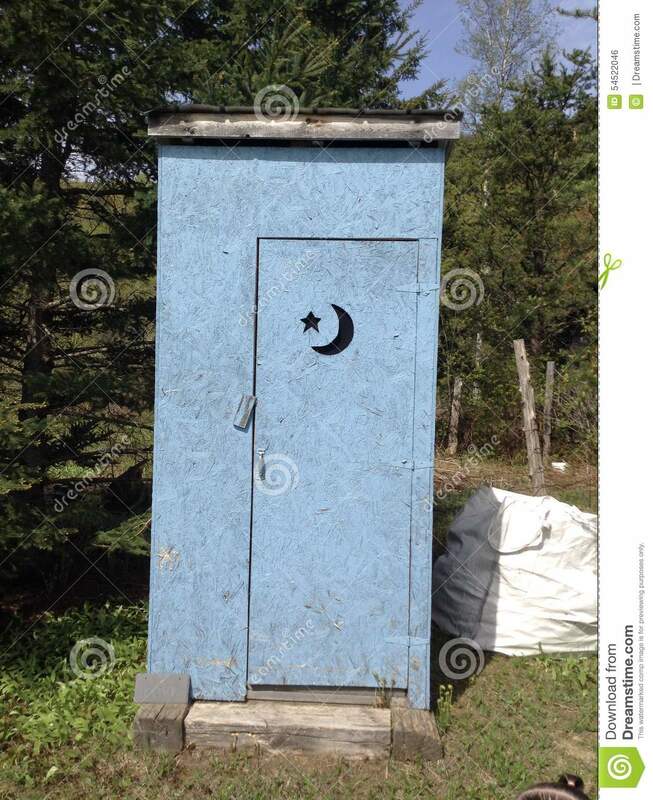 The little house with a crescent moon cutout in the door? Since he’s a bachelor, that’s plenty for Brother 120-Hours-A-Week. It’s not bad in winter, when there are fewer flies. Hahaha!! That’s hilarious . . . At least he wouldn’t have to go far when nature calls, if he’s ever at home, that is. It makes sense given the duties ascribed. Basically you would be tethered to the position so you’re only expenses would be gas and grocery. …and don’t forget to tithe. Wow. I made more as a private in the army in 1995. About 950.00 month. That would go against your principals? If he directs the school in the abscence of any principle, it’s a pretty typical Fundy school. There is no place in the US where one can afford a one-bedroom apartment on minimum wage, and that was true more than ten years ago. Doing all that with only 40 hours? My guess is they had him working 30 hours on paper, but expected him to add whatever extra time was in his heart to give. That would get him 5 whole dollars per official hour worked. I was wondering whether their principles are often absent. Might be close to 1956 dollars, I’d guess. And his pastoral duties include building maintenance, naturally. The church is big enough to house a school, yet they can’t pay this guy more than $150 a week or find someone to help with maintenance while does all his other assignments? That is one abusive employer. Doesn’t say what happens if the repaint the blue house in a different colour. And the deal is off! How do we know it’s describing the colour? “Until” he is married, huh? As in, it’s expected, I suppose. I’m guessing the MOG has a daughter of marriageable age, but she’s having a hard time finding a beau. It’s only appropriate to have a “youth” “pastor” related to the MOG. If he doesn’t have a son interested in the job, a son-in-law is next best. His daughter probably looks like one of Lord Walder Frey’s daughters on Game of Thrones. And why abbreviate “assist” to something confusing when there’s plenty of room on the page to spell out the whole word? For the same reason the whole thing is caps, I suppose. I doubt that someone who can’t operate the Caps Lock key on a typewriter is using terms like “aspartate aminotransferase,” so I assume that the head guy’s full formal title is Attention-Seeking Tool Pastor, which is no doubt truth in advertising. IT’S SUCH A GREAT JOB THEY HAD TO SPELL OUT HIS DUTIES IN ALL CAPS!!!!!!!! Come on, everyone. This is called a ‘ministry’. You are not supposed to make any money. You need to drive a POS car, live in a dump and eat bread and water. Because it is a ‘ministry’. Which is BS. Its what the MOG says to make you feel better about being on food stamps. Except you’re not allowed food stamps. Of course. How silly of me to suggest otherwise. I’ve been in small churches with bi-vocational pastors whose duties were mostly confined to preaching and working with the leadership/board. Members had to fill in for all the “extras” listed on this job description. What this church wanted was free labor. $150 a week is not a wage, it’s a tip. “Run, and be responsible for a bus route.” Gotta stay in shape if you want to be responsible for a bus route. And two weeks vacation minus one Sunday does not still equal two weeks. You wrote: minus one Sunday does not still equal two weeks. I reply: True, since part of that second week is spent preparing the Sunday service and message. Where I grew up, an average sermon [which is a good sermon] meant one hour of preparation for every minute in the pulpit. A great sermon meant two hours preparation for every minute in the pulpit. How long do IFB screechers screech? I rest my case. It does say housing is included. So wasn’t it $150 a week, housing, medical insurance and 2 week vacation? If he were comped housing and utilities that can be as much as $1500 he doesn’t have to pay for. Plus medical insurance ($200-300). Factor that in, he’s making about $2000 a month I would think. This is the “blue house” that will be provided. Wouldn’t he need a two-holer if he gets married? In 1996 you could get housing and utilities for much less than you describe, depending on location. And in the US, a full two week vacation is standard. The poor fellow gets only one Sunday off a year! He’s expected to get married. How is he going to buy flowers for the lady? Or take her out to someplace more exotic than McDonald’s, using coupons? (Hey, he couldn’t afford a newspaper subscription, so coupons would have been difficult to come by in 1996! He has to get married, because Timothy says he is to be the husband of one wife. My fundy aunt had a young interim pastor, that they wouldn’t make the directing pastor, until he got married. And give ‘Mickey D’ toys to the kids for Christmas presents. No, it isn’t. Even if your generous calculations were correct, there is a significant difference between being payed cash and being given stuff. *Ahem* Slaves in the antebellum South were given room and board. *Ahem* As Thomas Jefferson (ironically given my prior observation) noted, economic freedom is freedom. And as introductory finance would point out, the present value of the dollar is king. So, no. Trying to pretend that this arrangement is equitable or fair in any meaningful sense of either word is willful ignorance. Thing is, his “housing” could not unlikely have been anything from a trailer to a room in a property owned by the church which housed all the church’s single male employees. Under the circumstances, it’s also not unreasonable to question the quality of the health insurance provided by his employer. Finally, it would not be surprising to discover that he was being strongly encouraged to tithe on the value of his, ahem, “compensation package” as opposed to his $150/wk. salary. I live in my church’s parsonage. I could never live on $150 a week. Really who could–back in 1996 or now? Even as a single person. Food, car insurance, gas…. And $2000 a month–if your estimate is correct is still very small for all that he is doing. Lets say he has 4 times he is teaching (2 in the school, 1 youth night, probably sunday school for youth)–that includes hours of prep time—I would say at least 4 hours per teaching–16 hours there…. plus the hour the meetings are–so that is 20 hours just in his teaching, then you add the soul winning, he coordinates the bus ministry, directs school when the principal is gone, and directs video ministry. and then he is at the mercy of the pastor–any time the pastor needs assistance. This is slavery and abusive. Once you subtract gas, food, clothing, personal items, incidental expenses, car repairs and maintenance, Internet bill, tithe (is he expected to tithe on the housing too? Then we’re talking $200 in tithe right there), charitable giving, any expenses for the youth group, etc., that the budget doesn’t cover, that’s NOT a lot of money. $24,000 a year is still nothing no matter who you are, tbh. It’s just barely making it, and considering the physical and mental wreck he’s going to be with that list of duties, it probably won’t be worth it. This is like the beginning of a great novel. Since 1996, what has happened to Bro. ______ ? Did he get married? Did he move into the Blue House? Is the Blue House still blue? How much is he making now? May I ask: did this come from Bro. _______ himself? Does he kick himself for accepting $7200 per year? I knew churches that paid $150 – 200 for pulpit supply by ’96. Uhhh, my Episcopal Church pays $200 a week for a supply priest. Really. Very cheap! I’m surprised they get anyone, actually. And some of those they get probably don’t get any offers elsewhere, since a couple of them have never delivered a prepared sermon in my hearing! Off the cuff and awful. They are trying to find a regular priest. The first round did not go so well. At the parish I am attending now, the priest appears to be very good, caring, and well prepared. Re: your parish priest — you are blessed! There’s no need to pay someone a decent wage when you can guilt them into believing that God wants them to work all the time and suffer in poverty. What’s sad to me is that the poor man has two major responsibilities on Sunday mornings—-the youth and also the bus ministry. It would be impossible to do both things well. Somehow this reminded me of the Youth/Asst (I didn’t have room to spell it out) Pastor at a church when I was growing up. His house was attached to the church. Their family/living room was used for Sunday School classes and anything else that the church needed. People would use their bathroom b/c the church (of course) did not have a big enough church bathroom. I really felt sorry for them b/c they had to act gracious about people always in their home. Some church people thought it was just okay to wander around their home. The house wasn’t blue but he was married. Wonder if this guy is still married. This may be a good point to bring up wedding and funeral honoraria. Some folks think that clergy get rich off these fees. The truth is, they don’t. Some clergy turn the money over to the church, or put it in a separate Discretionary Fund, for needs outside the church budget. The most I ever received for a wedding or funeral was $200. Each wedding takes at least 30 hours of my time including counseling, so it works out to $15 per hour. Funerals usually take a bit less time but if the person had a lingering death, there were many home and hospital visits, plus follow-up after the funeral. My parents are the church pianist and organist……have been for ever as long as I can remember! They do not get paid for their time for playing. They are also assumed (apparently) to be part of the church facilities for funerals b/c only once in all those years have they gotten anything for playing. Not that they do it for money, but something would be nice, especially from families of people that don’t attend the church. Thanks for the job offer, but I find I must decline. I’ve been offered a positions cleaning out Ebola isolation wards that I cannot pass up. It’s true that this new job does not include the use of a Blue House, should I ever marry, but at least it gives me weekends off. Lol @ your letter, but in all seriousness, our church missionary is a nurse practitioner who traveled to east Africa last December to reopen clinics that had been closed by the epidemic. She had a woman come in that they suspected the disease in, and she said she was terrified, but still she stayed, over Christmas, to help. I was in awe of her commitment. Just a side note there. I respect her and admire her, but I don’t envy her. Wait, I thought it was only Catholics leaders who took a vow of poverty…they don’t want to send the wrong message, do they? $150 a week!! Wow, that guy’s gonna get filthy rich! When my sweet husband was single (about 5 or 6 years ago) he worked a similar job at an IFB church and got paid $70 every 2 weeks and lived in the church basement — he could hardly afford groceries. Nothing like expired canned goods to make a man holy! He was also expected to be on-call 24/7. I do know that many preachers are not paid well by the congregation. Churches like this are often run by certain families and the preacher has very little real power. But I am also aware of the way preacher salaries are constructed, having been a deacon on the budget committee, and I saw how their salaries are padded. In a strong-MoG ruled church, the actual salary can be presented as a very modest, even very limited income while being very generous in reality. * The salary, as a monthly check. * The Parsonage. The freedom from rent for such a house was figured out to be about $800 per month. * Utilities. The church paid for the parsonage electricity, water, sewer, etc. A good $300 bonus, there, especially in the winter months. * Cell phone. The charges kept going up, too. * Health insurance. This is a big one. A recent year was something like $6000 for the premiums, and it was still high deductible and catastrophic only. * Pastor’s expense account. $250 a month to take other people out to dinner. Of course, he eats out as well. He can also use it on certain trips. * “Equity reimbursement.” Since he isn’t actually buying a house, he isn’t building equity. So pay him extra. Separate check. * Education expenses. Help him pay off his student debts to BJU. * Parsonage repairs. Including replacing appliances if they break down. One recent year budgeted over $2000 for that, but if it goes over, the church pays for it. * Pastor’s car. That’s right. The church pays for it. And gas. At the moment I don’t remember if there are other line items. But I do remember my wife complaining to me that I was such a bad money manager since the Pastor made a smaller salary than I did, but they could do so much more than we could. She didn’t like it when I started to tell her why. I really don’t think she believed me. In my mind, the deacons wouldn’t have dared to share the actual salary the Pastor really had, because the church wouldn’t have stood for it. Mind you, I don’t think the Pastor there is a bad person. He is IFB, but not as F as he thinks he is. Still, he lives much better than most of the congregation. And while that can enable some kinds of ministry IF he is inclined, I think that kind of income hiding is unethical and discourages empathy. Clergy “package” salaries may seem padded, but the goal here is to reduce tax expenses. So, the actual salary may seem low. Housing is tax-exempt if the minister is actually ordained, not “commissioned” or “licensed.” If the church owns the housing, then of course the church is obligated to repair. However, at least in the Episcopal church provided housing is increasingly rare. The church doesn’t want to be in the housing business and the cleric doesn’t want to be constantly going to a Board to beg for repairs or improvements. You’re fortunate that health insurance is only $6000 a year. Again, this is totally or partially tax exempt. When I left my last church in 2006, the bill was $12,000 a year for just the two of us. Car allowances are traditional, but I’ve insisted that the church pay me the standard Federal business rate, not a set amount monthly. That way the amount is not reportable, since it’s a wash. There are other expenses such as diocesan conventions, training fees, continuing education, etc. Keep in mind that non-Fundy clergy usually have much better, and thus more expensive, training. The standard is a Bachelors degree, plus 90 credits of very tough graduate studies (most Masters degree programs are about 32-35 credits), Clinical Pastoral Education, and sometimes an internship year. P.S. “Education expenses” are not for paying off student debts but for continuing education such as seminars and short courses. Or, at least that’s the way “education expenses” should be used. My first job in Fundyland paid $215 a month. My first church job was assistant pastor of youth, music and visitation and working in the ACE Christian School, overseeing it, with the pastor with the title of principal. My wife was the secretary and assistant to the learning center teacher and had to sub whenever the kindergarten teacher (the pastor’s wife) was sick. My training was not in education. I did teach bible and music, which were more my field and also taught PE the first year. Financially, it was a two for one deal, with my wife never getting paid. We ruined the plan when my wife was expecting a child within the first year. One of the deacons (I think he was a new deacon) was shocked when he found out that my wife worked for nothing and was expected not to have children any time soon. Looking back, we should have just passed on the job offer and waited for something else to come up. Fortunately for us the church was pretty well off financially for such a small church and we were able to stay there seven years. The people in the church were great. The situation I “signed on for,” not so much. My wife only went two years two college for Secretarial Science. That’s one of the disadvantages of an “independent” church—no oversight or accountability on the part of the pastor. In our Southern Baptist church the members vote on financial matters including the pastor’s salaries and benefits and it is handled by the treasurer who, incidentally, is not a member of the pastor’s family. Also, I’ve never heard this pastor mention money other than asking an offering for a visiting speaker. This matter of the pastor holding the money did not even occur in the independent Baptist church I grew up in in the 1960’s. The extreme fundies like Hyles and Rice seem to have started that phenomenon, at least it seems so. I’ve been away from all that a long time so I’m sure there is more to the story. That sounds a lot like the situation in my independent church. Everything is voted on, everything transparent. So it isn’t independence per se, it’s the willingness of the leader to eat the flock. If the leader is eating you, leave. “Vote with your feet”. So thankful that secretary stood up for you! I know people who do very similar labor, with no compensation, and love it! There is a difference between loving the work and loving the financial situation. Would any of the “people you know” say anything different to you than “I love the work”? Yes, and they are called “volunteers” and are usually doing so because they want to. 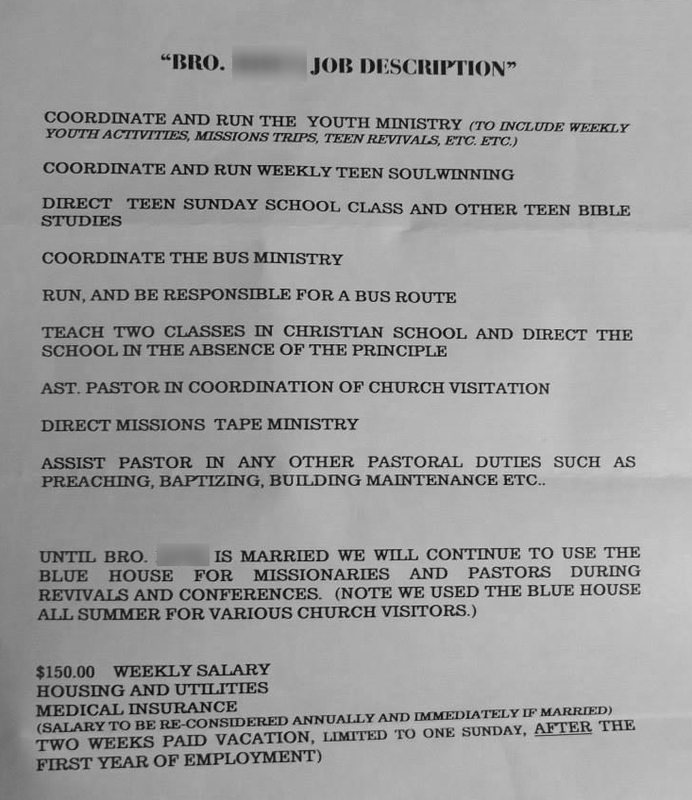 Not because this is the only job their education suited them for and because a church knows they can guilt a gullible young man into thinking he’s doing it for the Lord and his compensation is reasonable. You realize this guy makes LESS THAN HALF what I make per month… as a restaurant worker?